We first met the Sayaka Inka at a healing gathering called, Return of the Ancestors, in April, 2009 in Sedona, Arizona. This group consisted of 3 brothers, a cousin and a family friend. 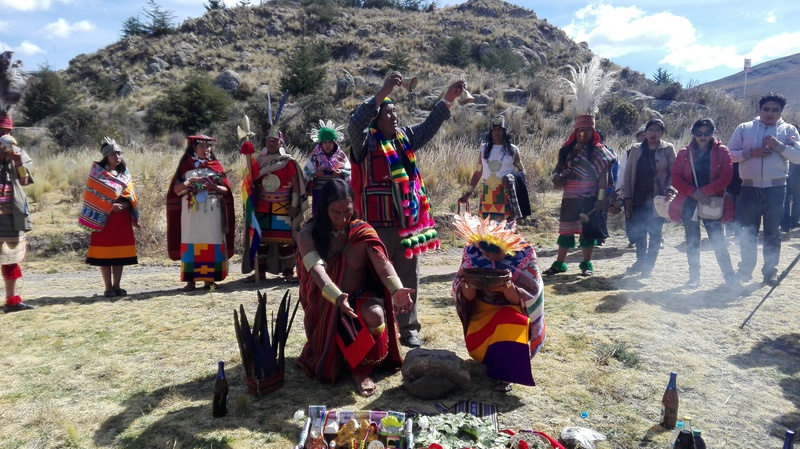 The brothers are direct Incan decendents who are named after their village in the mountains northwest of Lake Titicaca. Their music reflects their heritage and exemplifies a close bond with Mother Earth. Hearing them play for the first time left us all very moved and cultivated a desire to learn more about these beautiful people and their culture and history. They speak their traditional language, Quechua as well Spanish. Connie speaks Spanish fluently and quickly befriended the group. We hosted the family a month later in San Francisco where FGH sponsored and planned a concert event where they were the featured group. They stayed in our home and as we came to know them, their devotion to ceremony, and gratitude to Mother Earth for all that she provides for us was part of their daily way of life. It was moving and inspiring and as we were invited to visit them in Peru, we wanted to visit this beautiful country and learn more about this ancient Incan culture and their people. In August, 2011 we made the journey to Puno, Peru on the western shore of Lake Titicaca. We traveled with the family to Machu Pechu, Cusco and to their village of Sayaka up in the mountains. We were struck by how often our van was pulled over by various road side check points. Our time in Peru included several ceremonies lead by the Sayaka family including the patriarch of their family who was close to 100 years old (their Dads name). We met their relatives still living the Village of Sayaka. This remote village of perhaps a hundred people remaining has an irrigation system built hundreds, perhaps thousands years ago when Sayaka was thriving. Many of the young people have left the village to work in the mining industry and a few farm for food in the harsh mountain climate. Our trip was memorable and profound on so many levels. Perhaps the greatest gift of our time in Peru was that even though many of the people live in severe poverty, the generosity of those we met was heartwarming as they shared what little food they had with us. We will be forever grateful for the experiences we shared and the generosity we received from the Sayaka Inca Group and their people. This 21st of September we are celebrating 30 years of traditional Andean music. The government of Peru wants to know how many years we have been playing music in Peru. They ask us for documents that support this. SAYAKA INKA The truth is we have been playing more than 30 years, the oldest document we have is thirty years old.